Photo: Workshop participants at Split this Rock Poetry Festival. I find great joy in teaching and am available to teach workshops about archival material as kindling for creativity, documentary poetry, research skills for writers, and more. If you're with a library, museum, or archive that would like to expand its patron base by inviting creatives to find inspiration in your archival material, you're in the right place. That is one of my specialties! Workshops provide a lively, inclusive space for creatives to learn, make, and share, foster a sense of community, and provide an opportunity to find inspiration in each others' work. I teach periodically at the Visual Arts Center of Richmond, The Library of Virginia, and other venues in and around RVA, and am available to teach workshops on-location and online. I've also taught a documentary poetry workshop at the Split This Rock Poetry Festival, and from 2012 to 2015, volunteered with SAGE Central Virginia leading creative writing groups for LGBTQ elders and a multi-generational group of women-loving-women. 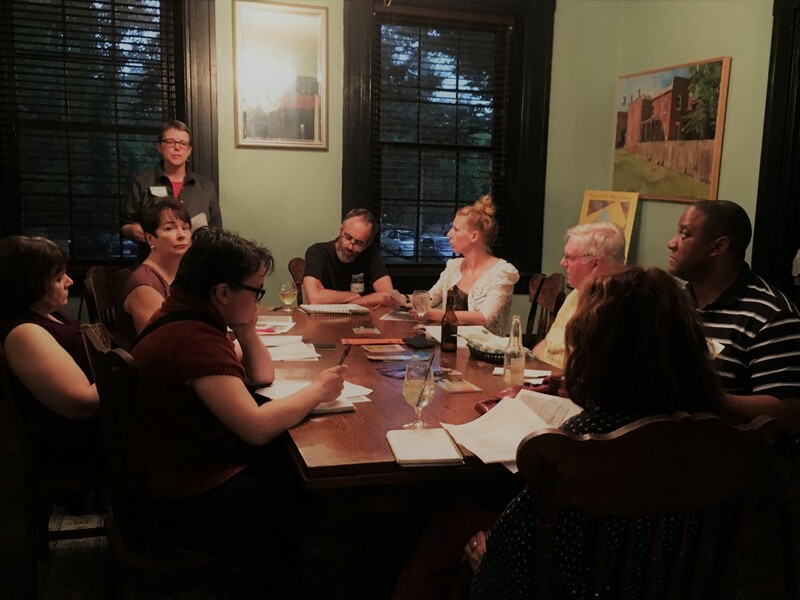 Photo: Facilitating the Literary Salon "Mining Documents for Inspiration" for James River Writers and the Poe Museum. Poems can often capture an experience, relationship, person, or place in a way that may elude us in other types of writing. Remembrance poems can serve as vessels to carry these experiences, people, or places, carry them so you may return to them for comfort, connection, or inspiration, and carry them so you may share them with other people in your life. They may even carry a story about yourself that you'd like others to know and remember. Although these poems can be elegies, they are not limited to remembrances of people who have died. They may be elegies for the living too. Who or what would you like to carry with you in this way? Personalized with details gathered through conversation or correspondence, these may be poems of admiration, gratefulness, love, friendship, kinship, resilience, struggle, wonder, awakening, memory, or mystery, or poems that express something that has gone unspoken for so long that it's hard to figure out how to say it. Are you in the process of putting together a poetry chapbook or full-length collection to send out for contests or other opportunities? Would you like someone else to review the manuscript and give you feedback? This option could be exactly what you need. Wendy’s comments on my poetry manuscript were spot-on. In places where I knew a poem was bothering me, Wendy provided the right suggestion every time. She was an enormously invested reader, giving both supportive and critical feedback. She was a mirror for what I was doing well, but also nudged my work forward in substantive ways. As I reviewed her numerous and generous comments on each of my poems, I appreciated how she responded as a human being, an interested reader, and an honest critic. She is skilled in knowing when syntax or sound is off, when a word or phrase is unnecessary, or when reorganizing is needed to highlight a poetic turn. She catches any odd connotations that words, phrases and titles evoke, and she suggests strong alternatives. Studying my revisions based on her feedback, I see how her critique enhanced the voice and pacing of my poems. Mentoring offers a chance for me to witness another poet's writing journey, help them refine their poetic craft, and find poems by other poets that resonate with them. Along the way, poets often discover (or rediscover) their poetic voice and gradually develop a voice that is more fully their own. Whether you're already a published poet or have no desire to publish your work, or fall somewhere in between, poetry mentoring can provide you with meaningful feedback from a critical yet caring lens so that you can grow and perhaps take new risks in your poetry. I work with poets through poetry packets, which can be scheduled one at a time (a good fit for writers who prefer an open-ended schedule and no ongoing commitment) or three at a time within a six-month period (a good fit for writers motivated by deadlines or who prefer a structured schedule).